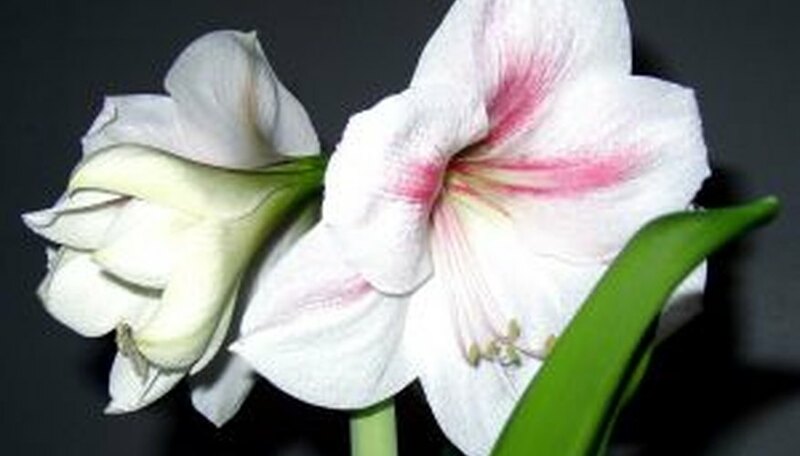 Striking amaryllis is often forced into bloom near Christmas to add winter color to the holidays. Large red, white or orange flowers blossom in clusters from the top of a 2-foot tall flower stalk. After blooming, the amaryllis foliage continues to remain green, so it can collect and store nutrients for the next blooming period. Once the foliage dies back, amaryllis requires a period of dormancy in order to bloom again. Amaryllis planted in the ground experiences this naturally when winter comes, but potted amaryllis must be stored properly to force a dormancy period. Plan to induce dormancy and store your bulb 16 to 18 weeks before you desire blooming. Store bulbs in late August or early September for Christmas blooms. Move the pot into a cool, dimly lit area such as a basement or garage. Allow the leaves to brown and die back naturally. Cut off the leaves 1 inch above the soil surface once they turn brown and die. Use sharp scissors or garden shears to avoid pulling on the leaves and damaging the bulb. Lay down a sheet of newspaper, and turn the soil out of the pot onto it. Brush all the excess soil from the amaryllis bulb. Fill a perforated plastic bag with dry vermiculite or peat moss. Place the bulb inside, and store it in a dark 50-degree Fahrenheit location for 8 to 10 weeks. Replant the bulb in fresh potting soil inside a pot 2 inches larger than the diameter of the bulb. Water regularly and place in a bright, warm location to induce growth and the blooming period. Divide amaryllis before inducing dormancy. Twist off any side bulbs that have formed, and store for repotting. A refrigerator supplies the proper temperature and darkness level for storage. Check the storing medium and bulb for excessive moisture regularly during storage to avoid rot.